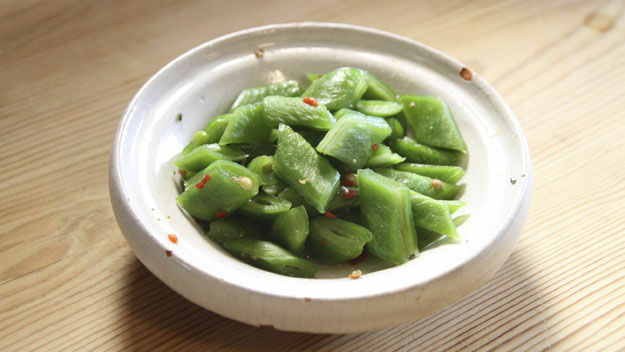 This recipe for Runner Bean Pickles appeared in the recent series of River Cottage which focused on vegetarian dishes. I’m more or less repeating it here verbatim (original at the Channel 4 website) but it’s also worth saying that this quick pickling method appears to be worth trying with other veg. The secret is to shoosh the veg around in a plastic bag with some seasonings (salt being important for drawing out the vegetables’ natural juices), then press out as much air from the bag as you can and weigh down the contents with maybe something like a plate with a can on top. Wait a couple of hours and bobs-yer-uncle, quick pickle. I’m certainly going to give it a try. Put all the dry ingredients into a plastic bag and shake to combine. Add the beans and give the bag a really good shake to ensure the beans are thoroughly coated in the spice mix. Roll the bag up to remove excess air, weight it down (as mentioned above) then set aside for about 2 hours. Before serving drain off the water that has been drawn from the beans. This pickle is fresh and sharp and goes perfectly with cheese. It’s been a long time since I contributed to my own site here and after much um-ing and ah-ing over whether or not to continue Gentle Voice or amalgamate this with my blog, here I am again, posting here. I am nothing if not indecisive. I think. So without any more wiffle, here’s a little treat for the tastebuds: Chicken Waldorf Salad. This is an incredibly simple but oh so tasty recipe. Don’t be afraid to alter amounts of the separate ingredients because it’s a very forgiving combo of flavours and creativity is the key to good cooking I say! 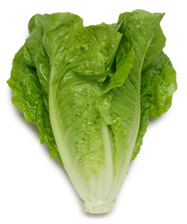 Lettuce leaves (something crunchy like Cos / Romaine lettuce is good). Minestrone is such a wonderful soup. It’s low calorie yet jam-packed with flavour and vitamin goodness and is so easy to make. Below is my recipe – not authentic but utterly delicious. The use of Spanish chorizo gives a delicious, rich smokey undertone that I personally love. (This would make a good vegetarian supper – just leave out the chorizo – the beans, of course, providing a good source of protein). That’s the beauty of this soup – make it your own with your own combination of favourite Summertime herbs and vegetables and don’t get too strung out on amounts. If you over enthusiastically end up with a little too much veg in the pot, just add more stock to compensate. One word of advice before we begin – try to chop the veg consistently quite small (cm cubes should do it). It’s not a deal breaker but the finished product will look so much prettier. Heat the oil in a large saucepan and toss in the chorizo and then the onion. Allow to fry gently for 2-3 minutes and then add the carrots, potatoes, celery, peas and beans. Stir and continue to fry gently for another 2-3 mins, just to let the vegetables begin to ‘sweat’. Add the chopped tomatoes, beans, thyme, vegetable stock and black pepper. (I would only add extra salt, if needed, at the end of cooking because most commercially prepared stocks already contain a lot of salt). Bring to the boil and then reduce the heat right down, partially cover the pan and allow the soup to simmer gently for 30 minutes. At the end of this time check how the hardest vegetables are doing – they should be yielding but not mushy – and taste to check the seasoning. If needed, leave to simmer for a further 10 minutes. To serve, you can sprinkle this soup with a little fresh, grated parmesan cheese and/or a drizzle of extra virgin olive oil. This soup is very nice served with warm, crusty French bread. Summer is, of course, the best and easiest season in which to source fresh, locally grown produce. However while supermarket shelves are heaving under the weight of fresh fruit and vegetables at this time of year, you need to be aware that many are still sourced from way beyond your direct area. It’s quite possible that there are smaller, local producers selling many of the same products fresh from the fields and this is why I’m a fan of farm shops. Seek them out and you will often be rewarded with the best fruit and veg money can buy and the satisfaction of knowing that you are supporting traders in your own community. It may be that supermarket shopping is easier for you and that buying locally produced goods is less of a priority. Whatever the case, Summertime gives us an enormous variety of fruit, veg, fish and meat which is at its best at this time of year. *(Seasons and availability of produce obviously varies from country to country depending on geographical location. This list is primarily based around location in the UK & western Europe). Did you know that in meteororololololgical terms Spring begins on 1st March, Summer on 1st June, Autumn – 1st September and Winter – 1st December? Those dates make more sense to me in terms of what the weather is actually doing, certainly where I live, and in my own mind this is closer to how I think of the year. (That still doesn’t make ‘Midsummer’s‘ day on 21st June mind you). Confusing, innit? Well, just who went and confused things by willy nilly declaring the start of the seasons as the 21st of March, June, September and December? I bet it was those pesky Christians (no hate mail please – to all intents and purposes I’m one of them …which doesn’t necessarily mean that I’m currently a fully paid-up member of the club). If you know the answer, do tell. Happy Fathers’ Day to all the Dads out there. If you haven’t already, check out the videos I posted yesterday: A funny (and wincingly painful) clip from the brilliant Paul Merton’s trip to India, and maybe my favourite ad of all time (well…so far), the Guinness surfers and white horses ad. Battling with aphids (greenfly) in the garden? Commercially available insecticides often contain a chemical called pyrethrum which is derived from nature. Rather than buying bottles of commercially prepared and potentially hazardous chemicals, you can harness the power of nature in deterring greenfly just by some clever planting. Feverfew (Tanacetum parthenium) is a pretty daisy-like plant that contains pyrethrins – very similar to the chemicals in commercial sprays. Plant Feverfew amongst your flowers and it’s presence will deter the little insect marauders. Golden feverfew is a pretty plant in its own right – as the name suggests its foliage is a yellow/golden colour – and all plants will readily self-seed all over the garden if you allow them to. (This plant is also used as a traditional herbal remedy for migraine). Whilst it is possible to make your own insecticidal spray or powder from these plants I wouldn’t advise it as it is toxic to bees. In its plant form it seems to work well enough for me and does no harm to bees. Some sources claim that it will deter bees from the garden, although I have never found this to be the case and have often seen bees visiting the feverfew flowers.